You hate to see it. The cats are tied to the roof and it’s pretty clear that, in a real-world scenario, cats would definitely not be moored to a roof for no reason. This is just one of the many production difficulties faced by Tom, coma-survivor and protagonist of Omer Fast’s debut feature film Remainder. Based on Tom McCarthy’s novel (McCarthy also co-write the script), Fast’s film is about memory, repetition, remembering things, repetition, memory, remembering things, repetition. Wait. Have we been here before? Certainly, other films have mined the rich seam of amnesia and memory impairment to great effect (here’s to you, Mr. Nolan), and once it’s acknowledged that Fast borrows considerably from Last Year In Marienbad and Twelve Monkeys, you’d be forgiven for wondering whether you’ve seen and heard most of it already. 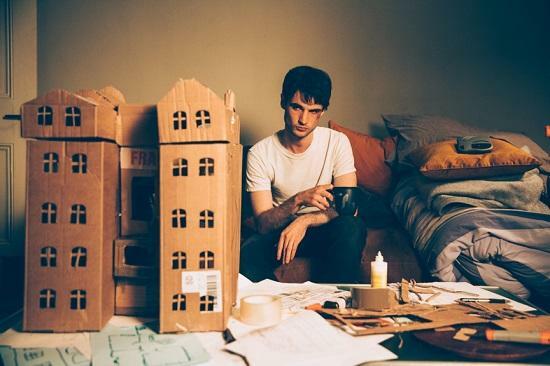 The story concerns Tom’s (Tom Sturridge) recovery from a near-fatal accident that saw him tomb-stoned by a piece of stray equipment falling from an office building. He makes it back to life, receives a huge financial settlement, and looks set to live it up. However, his accident damages him in ways that resist an obvious diagnosis. He loses interest in life’s customary pleasures and becomes anxious in public. The only thing that seems to energize him is an exploration of his past, which he can afford to re-enact using expensively acquired sets. He holds tyrannical sway over a crew of actors hired to replicate his half-forgotten memories – he’s searching for something, but it’s hard to say what. These aspects of the narrative are mostly faithful to the novel, and so the big question is whether Fast has found something new in the combination of McCarthy’s story with Nolan-inspired time trickery. Over the course of its first few chapters, the novel seems concerned with a simple question: what do you when restored to life after an accident? (Restored to life, that is, with a bank account now swollen with out-of-court hush money). But its nameless narrator is difficult to fathom – his post-traumatic life is consumed by fascination with a god-like level of control over created worlds, and yet he has little interest in the people that populate them. Something about these experiments in repetition and self-staging seems to bring about a trance-like state of euphoria. Is he undergoing some sort of radical self-administered therapy, or is his brain damaged beyond repair? The novel keeps you beholden to that uncertainty in a way that the film doesn’t quite manage. Fast’s adaptation takes the same premise and runs both forwards and backwards with it, crafting a similar meditation on memory, repetition and trauma but also shoe-horning the story into a heist structure that is less than central in the source material. It satisfies the need to transform the text into something more obviously cinematic, but it never gets around to compensating for the loss of internality that a first-person narrator provides. (Although, the film does generate an equivalent to its epistemological kiss and chase). Instead, what we’re left with is a film that captures some of the same eeriness, but without anything like the same affectless quality that makes the novel so prickly and engaging. Tom Sturridge is unconvincing in the lead role, but, in his defence, it’s difficult to know what he should be portraying. He comes across as embittered and stroppy, distinctly at odds with his character’s heroic consumption of painkillers. Ultimately, the film is more derivative than riveting. Like Memento, or Inception, it is designed to be a self-contained puzzle, the key question of which is that asked by Mark Fisher in his discussion of the ‘Gold Room’ scene in The Shining. Specifically: "What is the time when Jack meets Grady?" (Ghost Of My Life, Zero Books, 2014). Fisher argues that The Shining is a ‘hauntological’ work, concerned with the spectral space between being and nothingness. The foreshortening of time in the Gold Room scene epitomises this – the former and current caretaker meet in a re-tracing of past reality which cannot be ‘real’ and yet still takes place. By the end of Remainder we’re left asking: what is the time in which Tom’s escapades take place? Its ontology is similarly spooked, but we’re not dealing with anything quite so interesting. The film wants to say something about repetition and the space between being and nothingness, but because it can’t let go of the book’s fascination with re-enactment and simulation, it all gets a bit crowded with ideas that have no space in which to breathe. Fast’s film can’t accommodate enough of what makes the book tick, and in terms of its separate identity as a standalone film you’d be forgiven for wondering whether you’ve... wait. Have we been here before?